Hope College will present an organ concert featuring guest artist Dongho Lee on Tuesday, March 13, at 7:30 p.m. in Dimnent Memorial Chapel. The pieces performed during the program will be: “Allegro” from “Symphony No. 2, op. 20,” composed by Louis Vierne; “Folk Tune,” composed by Percy Whitlock; “Chorale No. 1 in E Major,” composed by César Franck; variations on “The Last Rose of Summer, op. 59,” composed by Dudley Buck; and “Prélude, adagio, et choral varié sur le thème du ‘Veni Creator’, Op. 4,” composed by Maurice Duruflé. A native of Seoul, South Korea, Dongho Lee was awarded both the First Prize (the Lilian Murtagh Memorial Prize) and the Audience Prize in the 2010 American Guild of Organists National Young Artists Competition in Organ Performance, which was held at the 50th national convention of the guild in Washington, D.C.
Lee earned undergraduate and graduate degrees from Yonsei University in Korea, where she studied with Dr. Tong-Soon Kwak. 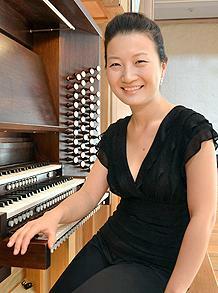 During her studies in Korea, she also served as organist of Seoul Anglican Cathedral. In 2004, she moved to the United States to continue her studies with Dr. Martin Jean at Yale University and the Yale Institute of Sacred Music, where she earned a second master’s degree and was awarded the Julia R. Sherman Prize for excellence in organ playing. Lee is currently completing her doctoral studies at Indiana University’s Jacobs School of Music, where she is a student of Dr. Christopher Young. At Indiana University she was a recipient of the inaugural Jacobs Scholarship and has also served as associate instructor of organ. Lee has played recitals throughout the United States, Europe, and South Korea. Other competition credits include First Prize in the 2001 Klais Jang Cheon Organ Competition (Seoul) and Finalist standing in the 2008 Canadian International Organ Competition (Montreal). She now resides in Durham, N.C., where she serves as music director and organist at Holy Trinity Episcopal Church in Fayetteville, N.C., and plays weekly hour-long demonstrations of the organs of Duke University Chapel. Her first commercial recording was released in early summer 2011 on the Pro Organo label, and features 20th-century organ music performed on the new C.B. Fisk organ at Indiana University. Lee is represented by Karen McFarlane Artists. Visual artist and author Makoto Fujimura will present “On Visual Theology: My Journey with Illumining the Four Holy Gospels” through the World Christian Lecture Series of Hope College on Monday, March 12, at 4 p.m. in Winants Auditorium of Graves Hall. Hope College will host its fifth annual High School Honors Band Festival concluding with a concert on Saturday, March 10, at 7:30 p.m. in Dimnent Memorial Chapel.